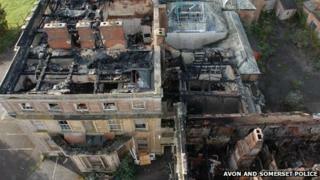 Arsonists who torched a Grade II-listed mansion in Somerset have been jailed. Stuart Walter, 23, of Lympsham, Nathan Goldfinch and Marcus Tancock, both 20 and from Weston, and Liam Grant, 19, of Cheddar all pleaded guilty to arson. The "particularly dangerous" fire, at Sandhill Park, cost Devon and Somerset Fire £30,000 to deal with, Taunton Crown Court heard. Judge Timothy Mousley said it was an "extreme case of mindless vandalism, planned and carefully executed". Tancock was sentenced to a total of 27 months for arson and dangerous driving. Walter and Goldfinch were sentenced to 12 and 18 months respectively for arson. Grant was sentenced to a total of 21 months for arson and two counts of fraud. Jailing the men Judge Timothy Mousley QC said: "Custodial sentences are justified for each of you, such is the seriousness of the offence." Veryan Heal, from English Heritage, said at the time of the fire Sandhill Park was on its "at risk" register. "People who target historic buildings are threatening a unique part of the country's heritage," Ms Heal said. "We hope that this [sentence] may serve as a deterrent to others who have little respect for England's built heritage." All three accused appeared before the court accused of starting the fire which badly damaged the mansion, near Bishops Lydeard, on 22 November 2011. Then firefighters were hampered by a lack of water at the scene and had to run hoses more than a mile long to a nearby health farm to get water. The blaze started on the first floor and spread to the remainder of the building including the roof space.